Indexes fell slightly on Thursday, but these two stocks endured larger declines. Stocks ticked lower on Thursday, as the Dow Jones Industrial Average (DJINDICES:^DJI) and the S&P 500 (SNPINDEX:^GSPC) indexes both logged declines of roughly 0.3%. Energy companies, as a group, had the best daily performance thanks to an uptick in oil prices. Yet weakness in the technology segment helped pull the overall market lower on the day. As for individual stocks, Thursday's biggest movers included SUPERVALU (NYSE:SVU) and Barnes & Noble (NYSE:BKS). The retailers both lowered their sales outlook on declining demand for their products. SUPERVALU shares fell 9% after it became the latest grocery distributor to warn about weakening operating trends in the industry by lowering its profit projection in a guidance update. Executives now see adjusted earnings falling by 5% in fiscal 2016. Its retailing segment, anchored by the Save-a-Lot chain, is growing at a slower pace lately thanks to grocery price deflation and a decline in food assistance benefits. "We are seeing softness in portions of our business," CEO Mark Gross said in a press release. The latest bout of price deflation has been cited by several other industry participants, including Sprouts Farmers Market and Kroger. SUPERVALU doesn't see those negative trends letting up until at least the end of the year, so second-quarter comparable-store sales are projected to be worse than the 1% drop the company posted in late July. On the bright side, SUPERVALU's wholesale business is performing as expected and is benefiting from a growing client base. That success, plus the fact that the retailer's struggles are industrywide, suggest investors shouldn't rush to sell this stock simply based on this week's guidance downgrade. Barnes & Noble shares fell 3% on heavy trading volume following a surprisingly weak second-quarter earnings report. Comparable-store sales slumped by 6%, marking a sharp deceleration from the prior quarter's 1% comp drop. The result was also well below the target CEO Ron Boire and his executive team had laid out. Management said the shortfall was tied to weak customer traffic combined with a soft overall book retailing environment. The store base ticked down to 638 locations from 640 three months ago. 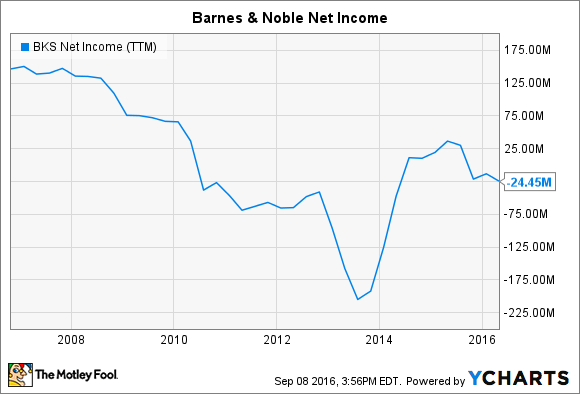 Net income has stayed stubbornly negative for Barnes & Noble. BKS Net Income (TTM) data by YCharts. Tight expense management will continue to deliver financial returns for the business, which is why the retailer affirmed its full-year earnings forecast. However, it lowered its sales growth projection and now sees comps falling this year. Given that the stock had surged 40% in 2016 heading into this week's report -- and the fact that management has identified both increased sales and lower expenses as key pillars in its turnaround strategy -- it's understandable investors would react harshly to Thursday's news. Revenue growth seems unlikely over the next few quarters.